The Liberty Pump CSP-257 is a 1/3HP crawl space, sump pump kit that features a automatic, sump pump with a magnetically operated vertical float switch (VMF). This sump pump kit also has a 16.5"x15" polyethylene sump basin with a cover and a flexible 24' hose kit with 1-1/4 discharge. The Liberty CSP-257 Sump Pump has a 1-1/2" NPT discharge, 1/2" solids-handling capability, and 18' shut-off head with 30 GPM at 10 feet of total dynamic head. 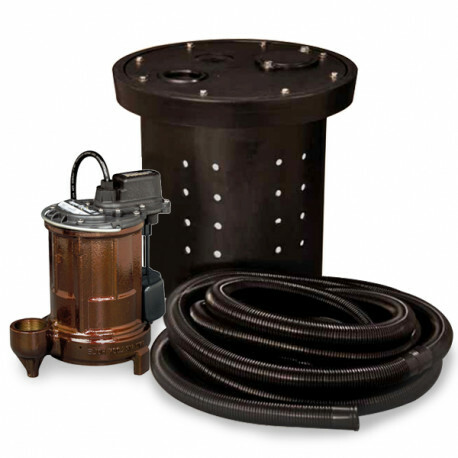 This crawl space sump pump kit also has a unique, one-piece cast iron housing. The 1/3HP motor on the Liberty CSP-257 is thermally protected and permanently lubricated. This Liberty sump kit is ideal for dewatering under homes, basements, crawl space areas and other areas where water may accumulate This 1/3HP crawl space sump pump kit is designed to control problems with mold, fungus, moisture and structural damage. Assembly is required for this crawl space sump pump kit. The Liberty sump kit can help reduce problems with rodents, insects and pests that are attracted to wet environments.